Finance refers to raising money. It serves the liability side of the balance sheet. Basically you can go three ways, debt, equity and/or subsidy'. Debt is provided by banks against collateral and its needs to be paid back within a few years with interest. Equity is provided by investors against a share in the company. You need to share your profits and repay the investor when you sell the company. Subsidy is money you get from a stakeholder. You can keep the money when you achieve the goals that the subsidy giver has set for the subsidy. Before you start raising money you should ask yourself; Should I even be raising money? First of all, the group need to decide whether they prefer asset based investments (real estate, machines, inventory etc), R&D investments or working capital. Then they need to decide whether they prefer majority investments (mergers and acquisitions) or minority investments (venture capital). 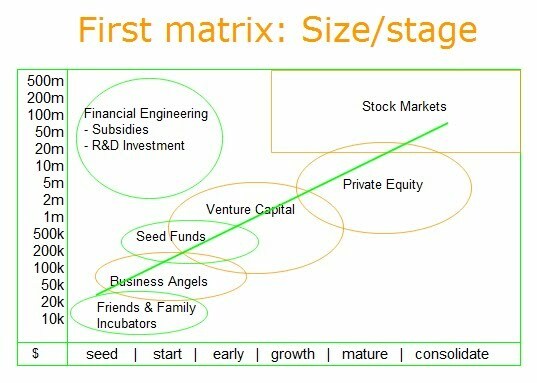 Furthermore it’s important to focus the investment activities on a limited range of development stages (pre-seed, start, early growth, etc) and investment amounts (see First Matrix above). * Secondly it is advisable to focus on a limited range of sectors or industries, whether it will be high tech, low tech or no tech and what kind of technologies. The Second Matrix might help group the choices. * It is also important to express the motivation for the investment activities. Is the motivation purely financial, or are there some social and/or environmental aspects involved. Experience teaches us that the most successful Angels Investors are slightly socially and/or environmentally motivated. The Third Matrix might help to position the investment activities in that respect. * Last but not least, it is advisable to choose a clear “service model”. Who is being served, the entrepreneurs, the investors or both? How far will the involvement go? Traditional Business Angel Networks should not be too involved otherwise they might dominate the market and crowd out private sector providers.